Running a family business with responsible strategies is a complex undertaking. Achieving this task in a fast growth environment without a supportive institutional setting goes beyond complexity: Business families in fast growth economies face challenges such as corruption, poverty, lack of skilled labour and fast-changing policies with little or no government support. These difficulties represent obstacles for families who are seeking not only to grow their business but to do so in a responsible and ethical manner. And yet, many business families in fast growth regions such as the Middle East and Asia have been known to be very much aware of their responsibilities to their communities and to dedicate considerable funds and resources to realising their duties. Frequently, these efforts go unrecognised or fail to create the desired impact as families often neglect to formalise their social responsibility policies and to make them an integral part of their governance and business strategy. Raising awareness among family business leaders on the increasing pressure on the next generation to lead a responsible business, should be a key mission of the family business advisor as their perspective and intervention can create clearer structures and reduce complexity. 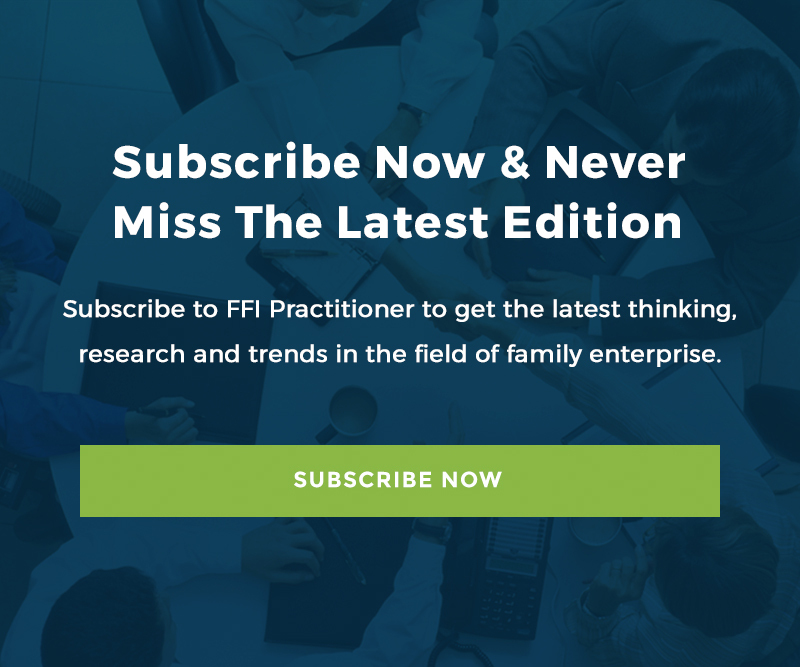 This article will aim at providing advisors with ideas on how to create awareness amongst family leaders of what the benefits are of formalising existing and future corporate social responsibility practices and how they can hand over a healthy and beautiful business to the next generation. In fast growth economies, family businesses are often called upon to be the care-takers of their communities and their environment and are usually considered the main job creators and innovation drivers in their respective economies. That family firms take these responsibilities seriously is widely demonstrated, but if and how these goals are part of their corporate strategy and are aligned with their core business activities is largely unstudied. In their day-to-day management family business leaders often have little time to formalise their approaches to responsible management, let alone communicate them to the community. In the field of social and environmental responsibility, much like in many other best-practice areas, there is no one solution that fits all especially when considering the widely diverging cultures and institutional settings business families operate in. What might be considered a valid CSR strategy in the US may very well not apply in the least to a family business based in emerging markets like the Middle East or Asia for instance. As the context changes, so does the scope and extent of social and environmental challenges and therefore the right strategies that address the fully have to be adapted. In fast-growth economies, the pressure on family businesses mounts as social and environmental responsibility has become an integral part of the corporate strategy discussion around the world. As the next generation members join their family companies, a generation that has grown up with the notion of an accessible world that allows direct comparison to individuals and families across the globe, business families are under considerable pressure to hand over a business that satisfies international regulations and standards. With the current emphasis on social and environmental best-practice, the question on whether and how family businesses in fast growth economies see and implement their corporate social responsibility (CSR) strategies is important to tackle. Making family business leaders aware of the increasing pressure on the next generation to lead a transparent and accountable business can therefore be a key contribution of the family business advisor. It can be an interesting role for an advisor to help business families discover what they are already doing right and how these efforts can be enhanced in terms of impact and, if so desired, in visibility. The first aspect to tackle could be to assist business families in making a difference between their philanthropic activities and what falls into the social responsibility category. Many family businesses in fast growth economies engage heavily in philanthropy and often go so far as to establish dedicated family funds with the goal to alleviate poverty and support education. Making a distinction between the family’s philanthropic engagement and actions that count as CSR can help families recognise what they are doing right and how they can formalise their objectives into mutually beneficial formats. Families often underestimate how it can benefit their reputation and profitability to accentuate their responsible practices. Whether it is how they treat their employees or what environmental practices they have in place, the community at large will feel more involved with the family business brand if these actions are well communicated. In many cases, businesses have found a correlation between their CSR activities and their profitability. Moreover, the impact on reputation is known to be positive feeding into one of the family businesses chief objectives; to enhance the family’s reputation. Through the right explanation, families can recognise that by formalising their social and environmental activities they can instill another source of pride for the next generation. Not only can it allow all family members to identify even more with the business but it might open up possibilities of including new jobs such as community manager or CSR ambassador which might appeal to family members. The importance of creating a legacy for the next generation that is based on responsible practices has to be a key mission for the incumbent leaders of family businesses around the world. Formalising social and environmental practices of family businesses in fast growth economies can reduce complexity and allow families to enjoy the benefits of their good-doing. Family business advisors can assist their clients in going through this formalisation process by enhancing their awareness and sharing the results with the community. The three approaches described above can be used to prepare the family for this formalisation process and to challenge the status quo. Ramia El-Agamy is the editor of Tharawat magazine, a global business publication with a special focus on family firms and entrepreneurship. Part of the Tharawat Family Business Forum, the magazine’s purview is the Arab world. Ramia can be reached at [email protected].